The tale of Sleeping Beauty dates back at least to Perrault’s version of 1697. This version contains many of the elements with which we are all familiar, although the second half of his tale is stranger, with a wicked stepmother trying to eat the princess and her children, before flinging herself into a pit of vipers of her own making. The tale borrows from other stories, such as the medieval romance Perceforest (1528) and the bit with Brynhild from the 13th century Volsunga saga. Other famous versions and interpretations include The Brothers Grimm story of 1812, and Tchaikovsky’s 1890 ballet. It has since been used in everything from modernized retellings of the tale to themes in popular shows such as Dollhouse. A few of the versions involve some dodgier fairy tale elements, but for the purposes of this post, I’ll stick to the well known and loved. In the 1959 Disney film version, the princess Aurora stays in a cabin in the forest, surrounded by friendly woodland creatures. These adorable, delicious sweet rolls are a nod to those animals, and are a simple dessert that both kids and adults will love. The whimsical animal shapes are as fun to play with as they are to eat, so go ahead and play with your food! Melt the butter in a small bowl in the microwave. Add the milk and stir to mix. In a large mixing bowl, thoroughly mix together 2 cups flour, yeast, sugar and salt. Add water, egg and the milk mixture; beat well. Add the remaining flour a bit at a time until the dough pulls together. Turn it out onto a lightly floured surface and knead until smooth, about 5 minutes. Cover the dough with a damp cloth and let rest for 10 minutes. Birds: Divide dough into 3″ balls. Roll out each ball into a snake shape about 8” long. Tie into a simple knot, leaving the “head” of the snake sticking out to be the head of the bird. Pinch a beak shape into the dough, then flatten the tail end. Take scissors and make a few snips in the tail to imitate feathers. Add two currants for eyes. Turtles: Make one large ball (about 3” across) for the shell, a medium one for the head, and five small ones for the feet and tail. Score the top of the shell to give it a pattern. Add two currants for eyes. Hedgehogs: Make a ball about 3” across, and shape one end into a point for the nose. 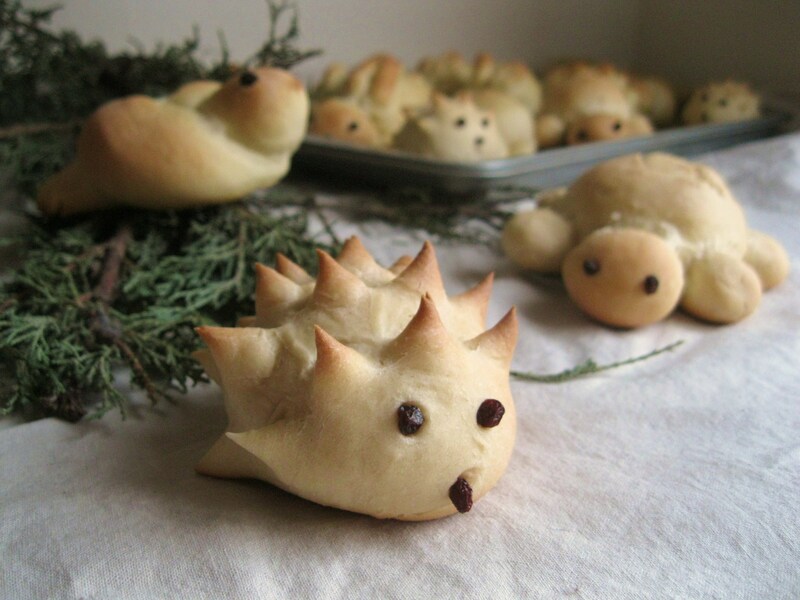 Take scissors and snip small triangle shapes out of the dough on the hedgehog’s back until the whole thing is covered with “spines”. Add three currants for eyes and nose. Place rolls on a baking sheet covered with parchment paper. Cover all rolls with a dishcloth and let rise until doubled, about 30 minutes. Preheat oven to 350 degrees F.
Bake in the preheated oven 15-18 minutes, or until slightly browned. For an extra treat, brush hot rolls with melted butter and dust with cinnamon sugar.